Legacy Building Solutions, an award-winning tension fabric structure manufacturer, is known for designing and installing custom building structures worldwide. Their solutions can be used in a variety of applications ranging from farming to aviation, military, and the oil and gas industry, among many more. Legacy Building Solutions choose Rocket55 to develop a comprehensive website that demonstrated their product standards, and spoke to each of their customers’ unique needs. Legacy Building Solutions’ award winning new website went on to receive Adfed’s “The Show” Award for Best B2B Website. Legacy Building Solutions had the unique opportunity to serve a wide variety of individuals in different industries all looking for high-quality building solutions to meet their needs. They needed a strategic website design that uniquely resonated with each of their customers, from government officials, to agricultural farm owners, aerospace experts and more. 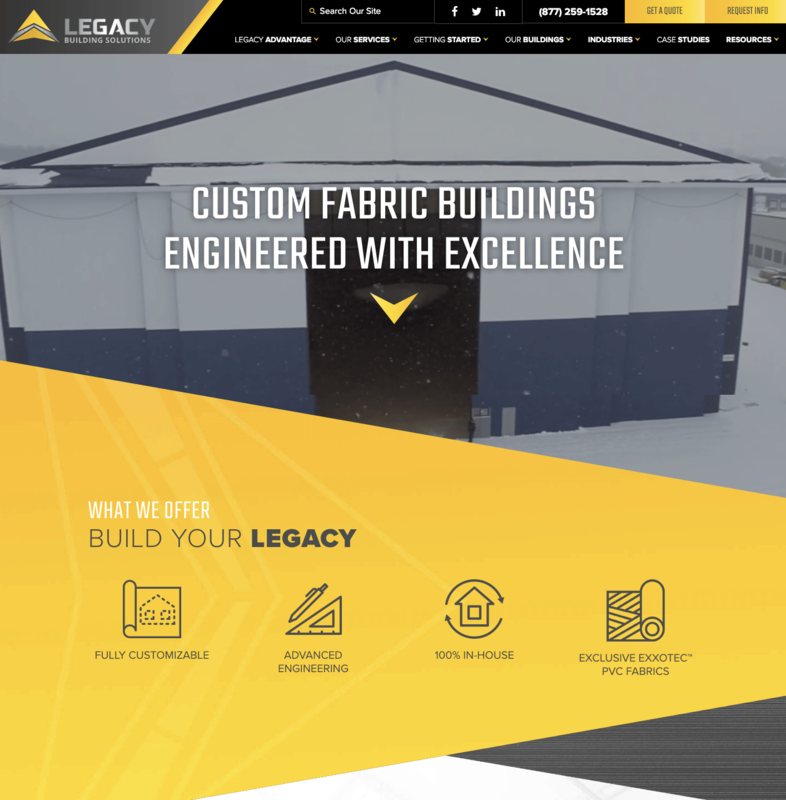 As leaders in the industry, Legacy Building Solutions also wanted to up the ante by elevating their overall website design to match their brand’s high standard of quality. Rocket55 took on these unique business challenges, and worked hand in hand with Legacy Building Solutions to understand their consumers and align their website to their vast market. Rocket55 developed a custom-built website that exemplifies Legacy Building Solutions’ high-standards of craftsmanship and acts as the foundation for their overall digital marketing strategy. Our team’s analysis informed the new strategic structure of the website, with purposeful architecture and engaging user-flows that resonated with their diverse customers. In conjunction, our experts designed their website to drive increased traffic by updating the structure so users could easily find their brand’s industry-specific information in a Google search. The website was also designed to support a detailed digital marketing strategy that was immediately put into action after the website launched. This included the creation of action-based ads, content and navigation to help steer educated website traffic to the right information — ultimately increasing qualified leads. Our goal was to execute a user-centric and conversion-focused design that reflected Legacy Building Solutions’ innovative products and principles. Rocket55 designed a website that was both visually dynamic and action-oriented, so that each user had a productive experience catered to their individual needs. The new website achieved this objective by intelligently incorporating content, imagery and UX best practices to appeal directly to each niche customer. Without sacrificing aesthetics, this mobile-first design allowed for easy navigation on all screen sizes and increased user engagement on all devices. Legacy came to us with the goal of increasing the number of qualified leads generated from the website. During our initial analysis of their website analytics, our team recognized that visitors had multiple purposes when using Legacy’s website, ranging from researching potential solutions to finding maintenance resources. Rocket55 organized and optimized their content to provide a fantastic user experience and facilitate clearer paths to desired information. As a result, the intuitive navigation and easily searchable content lead Legacy Building Solutions’ website to dramatically improve in organic search rankings. Rocket55 engineered a visually stunning and award-winning website experience for a forward-thinking client that resulted in more traffic, improved engagement and a substantial increase in qualified leads. Working hand in hand with Legacy Building Solutions, Rocket55 was able to create a refined user-journey resulting in a user-friendly website that showcased the right products to the right audiences. After the website launched, Legacy Building Solutions saw an increase in organic traffic which has continued to show significant growth through our ongoing SEO and content improvement efforts. Increased traffic through both paid and organic strategies has led to a drop in their cost per conversion, an increase in lead volume and quality, and ultimately more business.